And that’s because a Slimming World investigation has reportedly revealed that the low fat treat is actually… you guessed it, not low fat. The meaty sausages hit headlines last month when it was revealed that there was a nationwide shortage after dieters went mad for them. But now, those who stocked up their freezers are probably going to be feeling pretty emotional, as each sausage has actually allegedly been setting them back a third of their daily syn allowance… rather than the 30th that they initially thought. The analysis allegedly revealed that the sausages are ‘much higher in fat’ than the 3% that the company advertise. Each Porky Light sausage is said by the company to have 2.5g of fat – a massive difference when compared to the 13.5g in a regular pork sausage. Slimming World have not revealed how many grams of fat the Porky Light sausage was allegedly said to be after testing. The sausages, which have now been removed from the Slimming World app, were initially thought to be half of a syn. A syn is the Slimming World name for a cheeky treat, such as chocolate, crisps… Porky Lights…. However, according to a statement released today, they should be 4.5 syns each. Ouch. 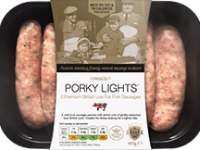 The statement said: ‘The Food Co-ordination team at Slimming World Head Office has done some analysis on Porky Lights sausages, after becoming a little concerned about their fatty (albeit delicious!) texture. ‘The analysis showed that the sausages were indeed much higher in fat than the nutrition panel indicated – and this does affect their Syn value significantly. ‘We’ve been in touch with Porky Lights to let them know our findings, and they’re looking into it as we speak. Full story from The Metro.